The German army is holding you in a holding cell under the ground in a large complex. 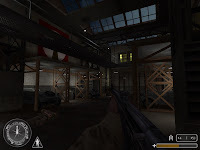 You have to find a way to escape from there, when you succeed you will have to find yourself a weapon before you can go on, (because the axis soldiers first shoot and than ask questions later). When you have a weapon you have to find yourself a way up and try to get out of the complex into the open air. Out of the complex you will find yourself in a little village, this all belongs still to the complex and you’re still not free. From now on the war will just intensify, (Baltic.Forever who did make all the scripting for this mappack did say after playing the map the first time; "It looks like I’m getting the whole German army after me!) Now begins the really hard part, and some people will maybe even say that it can't be done. But it can be done; you can get out of there and walk into freedom. Be very careful, and watch carefully in every corner for healthpacks. That's all I can say. This is the first one Leon release for Call of Duty series, so it was much more some twiking and learning that what he came with after for HL2. 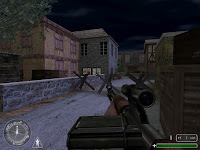 Design starts classic...you need to escape from a jail find a weapon and progress to the outdoor to complete the first one after you will need to cross the village full and protected by germans. Design is classic but correctly put together in a realistic design from the storage room to the garage and all offices linked on the first floor, the way your progression is handled is clever simply by passing near area you will travel across after, it really let the filling to travel a huge complex well crafted and put together. the indoor is ok but lighting doesn't always look perfect and for the outdoor even if the design let a good put together feeling, the fact that it's nor open and only surronded by walls make it a little too boxy in my opinion. Gameplay is correctly ballanced but challenging so you will need to progress like a sniper and need to save a lot if you don't want to loose you progression benefits. It's just a battle there are no real objectives except to kill all enemies, weapons and health are well placed sothat you will never run out of ammo it's simply ealised but also effciant in giving us some intertenment. In conclusion: For a first major release and even if it has it flaws, leon succeed in creating a attractive but challenging gameplay in a basic but efficiant design location, it's not the best out here but will certianly add some gameplay enjoyment for the people who want to check this one.